for exploring missile propulsion principles. mesh plate; wash bottle, funnel, eyedropper. cludes a beam scale for careful measurements. a neat, orderly work area. brand test tubes with rack, holder and brush. rod, red and blue litmus paper. 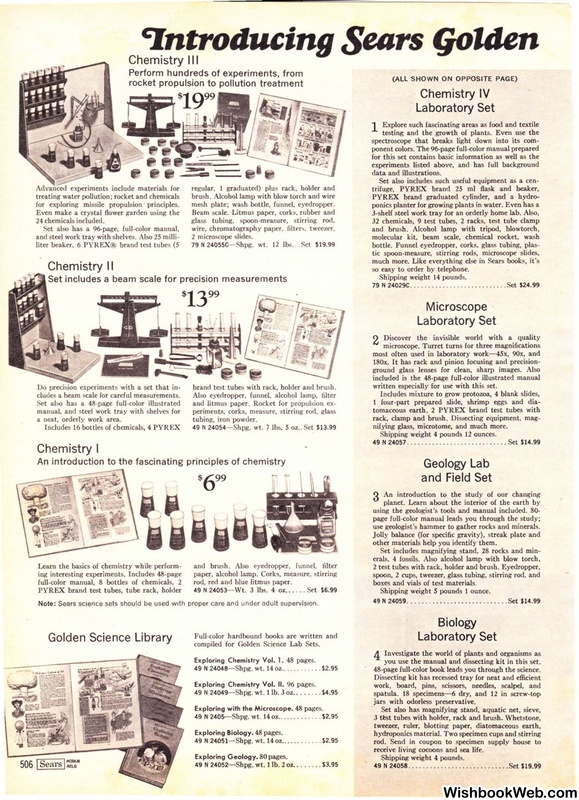 Sears science sets should be used with proper care and under adult supervision. compiled for Golden Science Lab Sets. Exploring Chemistry Vol. I. 48 pages. Exploring with the Microscope. 48 pages. 24029C. . . . . . . . . . .
written especially for use with this set. nifying glass, microtome, and much more. Shipping weight 4 pounds 12 ounces. planet. Learn about the interior of the earth by. use geologist's hammer to gather rocks and minerals. other materials help you identify them. boxes and vials of test materials. Shipping weight 5 pounds 1 ounce. you use the manual and dissecting kit in this set. 48-page full-color book leads you through the science. receive living cocoons and sea life.